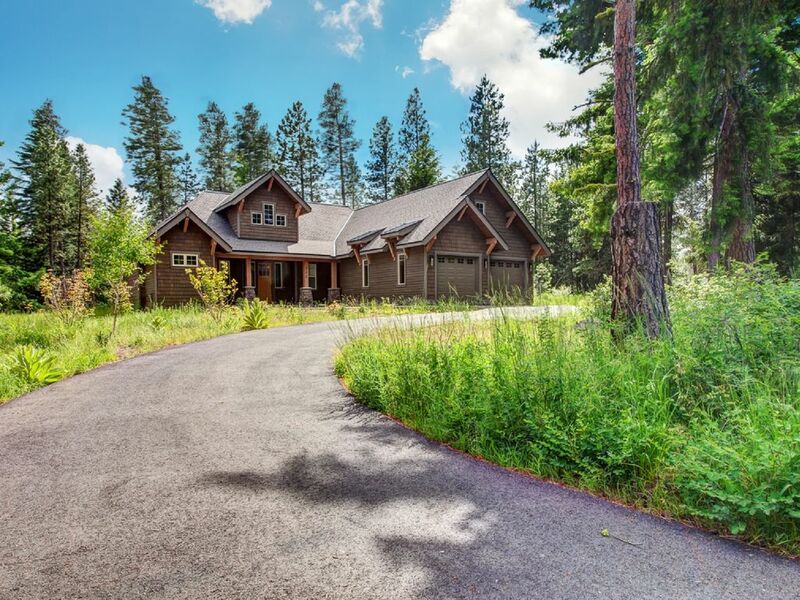 Wonderful one story floor plan looking right into the scenic forested mountains! Welcome to Suncadia Resort, a full service resort community. The long circular driveway leads you to this 2,043 square foot private custom home, which offers a wonderful one story floor plan with a large open great room that leads into the kitchen. The living room features a large sectional with a magnificent gas fireplace and large flat screen T.V. The kitchen and dining area have a wonderful large dining table to gather all your guests and a fully stocked chef’s kitchen with high end appliances and lots and lots of counter space. Looking from the great room and kitchen, you look right into the forested mountains. Outside, there is a large patio area featuring a wonderful fire pit, large entertaining area and private hot tub. The house has three bedrooms. The master bedroom is furnished with a king sized bed and a twin memory foam sleeper sofa, TV and and en suite bathroom with heated floors, double sinks and beautiful tiled shower. The second bedroom has a queen sized bed with a twin trundle and has a sliding door connecting it to the delightful outdoor patio area. The second full bathroom is located between the second and third bedrooms. This bathroom has a great shower and tub combination with heated tile floors. The third bedroom offers both a queen sized bed and built in bunk bed and easily sleeps four people. Access to the Fitness Center located at the Swim and Fitness Center. Blender, rice cooker, crock pot, Jack Lalanne Juicer. Eight at the table and two at the bar. Library with over 600 books to chose from. Available for rent through Suncadia recreation department. Two adult bicycles. One men's mountain bike and one women's cruiser. Set of 4 family scooters. Two championship courses. Rope Rider and Prospector. Dry Cedar Sauna located at the Swim and Fitness Center. Each home is stocked with the following supplies: •Towels: Number the home sleeps •Dishwasher Tablets: Number of bedrooms in Home (kept under sink in labeled container) •Paper Towels: 3 rolls per kitchen •Garbage Bags: 1 roll bathroom garbage bags, 1 roll kitchen bags, and 4 large black outdoor bags (kept under sink in labeled container) •Dish Soap: Standard Household Size •Laundry Detergent: Number of bedrooms in Home •Fabric Softener: Standard household size (if removed from home additional charges will be added to your guest folio). •Toilet Paper: 4 rolls per bathroom •Shampoo/Conditioner/Shower Gel/Body Lotion: 1 Large bottle of each per bathroom with either bathtub or shower (if removed from home additional charges will be added to your guest folio). •Hand Soap: 2 per bathroom We encourage you to bring extra supplies with you if you believe you will need additional supplies other than what is provided above. Charges may apply for requests for additional supplies. Remarkably well appointed and beautiful house. Everything was just so perfect from the kitchen which had some supplies, great appliances and everything to cook you could need to comfy beds and baths, well supplied. The outside covered area and fire pit, hot tub were welcome. And Suncadia is a really lovely resort with all kinds of things to do but the trails triumph. We really enjoyed this three day vacay and would come back in a heartbeat. This home was the perfect getaway for our family and friends. We had a few issues when we arrived with the wifi not connecting and we chose that house for the amenities they offered. After working with the suncadia manager, the owner of the home arrived and fixed the issues we were having and a few others that we could speak to him about. At other rentals we have stayed at, the owners are not easy to get a hold of, so we were very impressed that he came and dealt with it all. Once we got everything working properly, it was an amazing house! The spa was a huge hit and the view of the trees was so relaxing. The Master bathroom is state of the art with warming floors and towel rack:) The kitchen was fully stocked and so fun to cook in. The garage was full of scooters that we had a blast riding on the trail and a ping pong table. We had more than enough room for our guests and we will definitely recommend this home to others looking for a great getaway. You will not be disappointed by this property, we already long to return. This home was gorgeous! It was perfect for 7 of us, plenty of space and beds. The kitchen is amazing and is fully stocked. We enjoyed the hot tub during the snow. The shuttle to and from the spa was a huge bonus. I would definitely recommend this house and would stay here again. What a lovey home! 5 star resort this is! Our family had a great time...kids loved it! The snow was perfect to play in...hot tub was ready and clean! Loved taking resort shuttle over to ice skate then to Swiftwater Cellers for some food and wine! I definately reccomend this place. It also has its own circular driveway...secluded and safe...perfect for kid bike riding if you don't want them on the main bike path. This house was the perfect getaway for our family and friends. The layout of the home provides for ample space for a large group. We love to cook and the kitchen was well furnished with all the things you would need. The kids enjoyed the movies, games and hot tub that were all at our disposal. The ping pong table made for some great enjoyment as well. We will for sure be coming back to this place. The town was founded in 1886 as a coal mining company town. During the 20th century, the town gradually transitioned away from coal, and today its economy is primarily based on forestry and tourism. The town was the filming location for The Runner Stumbles, Northern Exposure, and The Man in the High Castle. Much of the town's history is preserved, and its downtown was added to the National Register of Historic Places in 1978. The 'Daily Resort Fee' of $55 is charged per room night booked. It is in addition to room, tax, and cleaning fee.